Reaction to the president’s announcement was mixed. The New York Times quickly editorialized that the shuttle was an "investment in the future" and that Nixon’s decision to approve the shuttle was "wise." Predictably, given their 1971 attempt to cut funding for shuttle studies, Senators William Proxmire (D-WI) and Walter Mondale (D-MN) announced that they would lead the Senate opposition to shuttle approval; in addition, Senator Edward Muskie (D-ME), at that point the likely opponent for Richard Nixon in the 1972 presidential election, also said that he opposed the program as a "boondoggle." Talking with his political operative Chuck Colson on January 9, Richard Nixon was pleased to hear that Muskie’s opposition to the shuttle "may have blown his chances in Florida completely." Nixon noted that "in Florida and California this [approving the shuttle] is a big deal. It will save the aerospace industry. "2 Whatever else his approval of the space shuttle meant to Richard Nixon, he saw it as an asset in terms of his reelection prospects. Meeting with Ehrlichman, Haldeman, and Shultz following the cabinet session, Nixon was still enthusiastic, saying “build the biggest [desalination] prototype that we possibly could in Southern California. . . Take the appro­priation, what is it, 27 million for this year? . . . Let’s move it up to 100 million dollars and . . . put the scientific effort to have it done in places like, maybe NASA.” Ehrlichman added, “put it in NASA and take it out of their bud­get. . . Cancel the rest of the moon program, and save a lot on the Spacelab [Skylab] and Mars. We’re not going to do any more lunar landings. We’re going to take all that money, you know 500 million dollars, and we’re going to put it on desalting possibilities.” Nixon chimed in: “I think the landing on the moon thing, see what we can do in terms of bugging that out. They’ll squeal but I need to put up the money [for desalination]. I can deal with the astronauts.” The conversations continued throughout the afternoon. Ehrlichman: Supposing we would say to the new head of NASA, that he has been concerned about presiding over a finite operation, [but] here is an open door now to certain permanent new [missions]. Nixon: Can we name it something other than National Aeronautics and Space? Ehrlichman: We’re working on that. Nixon: If we put some research projects in a few places, wonderful. Put a lot of them in California. Shultz: Why not take full advantage of everything about this? In broadening NASA’s horizons we can finally do that. They like the idea of a well defined mission in space and aeronautics, but they are gradually being brought to think a little bit more broadly. It was this combination of short and longer-term considerations—the cre­ation of jobs in California before the 1972 election, the interest in poten­tial national security uses of the space shuttle, and the desire to continue a human space flight program that would demonstrate U. S. space leadership to the world and be a source of national pride at home—that led to Richard Nixon’s approval of NASA’s full capability shuttle. Other factors, such as the ability of the shuttle to operate routinely and at greatly reduced costs, were not greatly influential as Nixon and his top advisers made that choice, even though they became the publicly offered justifications for shuttle devel­opment. So an evaluation of the shuttle’s impact on the American space program must begin with an assessment of the shuttle program in terms of those objectives that were the proximate reasons for the choice of the NASA – preferred shuttle. On June 16, NASA announced that it would be “examining the advantages of a ‘phased approach’ to the development of a reusable space shuttle system in which the orbiter vehicle would be developed first and initially tested with an interim expendable booster.” In addition, the NASA press release said, quoting Fletcher, “we have been studying. . . the idea of sequencing the development, test, and verification of critical new technology features of the system” such as its rocket engines, thermal protection, and electronic sys­tems. Fletcher added “we now believe that a ‘phased approach’ is feasible and may offer significant advantages.”46 To give its contractors additional time to explore the implications of such an approach, NASA extended its study con­tracts, which were due to expire on June 30, by four months. Recognizing that with the adoption of the phased approach Mathematica’s analysis of the economics of a fully reusable shuttle had been overtaken by events, NASA also gave Mathematica a contract extension to examine the economics of alternative shuttle systems. • retaining the capabilities that would convince the national security com­munity to commit to using the shuttle and would allow NASA to plan for a future shuttle-launched space station. The OMB-proposed program also included three Earth orbital missions using launch vehicles and spacecraft left over from the Apollo program. Only one of these missions, the 1975 docking mission with a Soviet spacecraft, had been in NASA’s September 30 “minimum acceptable” budget proposal. The other two would be Earth resources survey missions that had been included in NASA’s September 30 “alternate recommended program,” which pre­sumed a higher budget level; OMB suggested them as a way of having one human spaceflight mission per year between 1974 and 1976, thereby avoid­ing a multiyear gap in U. S. human space flight activity. 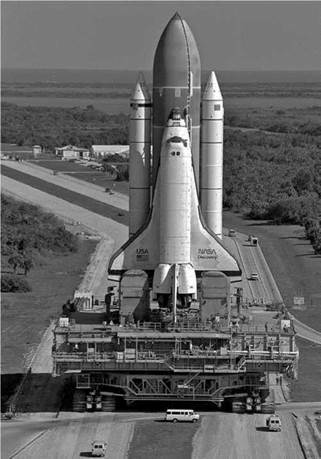 The smaller shuttle was anticipated to be ready for flight by 1978. With respect to Apollo 16 and 17, while the OMB alternative program canceled the missions on the basis that that was the president’s wish, the memo actually argued for retaining the missions. Saying “if concerns about complications during 1972 [Nixon’s already planned visits to China and the Soviet Union and the presidential election] can be alleviated by rescheduling Apollo 16, it would seem appro­priate to retain Apollo 16 and 17 for their scientific returns and employ­ment impacts.” OMB estimated that the employment impact of adopting its proposed alternative program would be 4,000 job losses by mid-1972 and 8,000 by the end of the year, but 30,000 by mid-1975. In OMB’s recom­mended program, the NASA budget for FY1973 would be $3.050 billion, declining to $2.975 billion by FY1976. Notably, OMB did not provide the president the option of approving NASA’s shuttle plans. 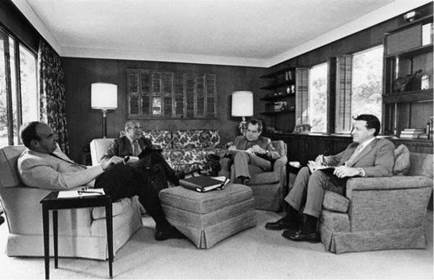 The OMB memorandum was discussed on December 3 as Ehrlichman, Shultz, and Cap Weinberger met with President Nixon at the Southern White House in Key Biscayne, Florida. There is no recording of the meeting, since Nixon had not set up a taping system in his office at Key Biscayne, but as was his custom Ehrlichman took notes. With respect to Apollo 16 and 17, Nixon suggested that it would be better to combine the two missions after the 1972 election, but that his aides should “work it out.” Apollo 16 was scheduled for March 1972, but Nixon suggested moving the launch to April to avoid any possibility of its interfering with his planned 1972 trip to China. (Nixon went to China between February 21 and 28; the Apollo 16 mission was launched on April 16.) Nixon on November 24 had already approved going ahead with Apollo 17; with this discussion of rescheduling the Apollo 16 mission, the pos­sibility of canceling one or both of the missions, a long-held Nixon wish, disappeared. With respect to OMB’s proposal for a smaller shuttle, Ehrlichman recorded Nixon’s response simply as “yes,” providing that the vehicle would use the “California engine.”8 The effect of Nixon saying “yes” to the smaller shuttle was to approve the recommendation that “OMB and OST proceed to work with NASA on a reorientation of the space program.” That process would take place during the rest of December. On the afternoon of December 29, 1971, Fletcher and Low met with George Shultz, Cap Weinberger, and Don Rice from OMB, Peter Flanigan and Jonathan Rose from the White House, and science adviser Ed David to present NASA’s proposal of how best to proceed with respect to the space shuttle. A decision was needed soon; the president’s budget message was due to go to the printer in the first week of January, and it would have to contain some indication of the fate of the space shuttle program. Fletcher on the morning of the meeting sent to Weinberger a letter reflecting the decisions reached within NASA in the past few days. The letter said: “We have concluded that the full capability 15 x 60′ 65,000# payload shuttle still represents a ‘best buy’ and in ordinary times should be developed. However, in recognition of the extremely severe near-term budgetary problems, we are recommending a somewhat smaller vehicle—one with a 14 x 45’—45,000# payload capability, at a somewhat reduced overall cost.” The letter added “this is the smallest vehicle we can still consider to be useful for manned flight as well as a variety of unmanned payloads.” NASA gave highest priority to retain­ing a shuttle configuration that was large and powerful enough to eventually launch components of a space station, and the 14 x 45 foot shuttle it was now recommending had that capability, even though it would not be able to launch the largest intelligence satellites or astronomical observatories. The Fletcher letter also reported NASA’s assessment of the shuttle design suggested by OMB, saying that “we have not been able to meet” the objec­tives of a development cost of less than $4 billion and a cost per flight of less than $5 million. NASA noted that the 30-foot payload bay length sug­gested by OMB “eliminates nearly all DOD payloads, some important space science payloads, most application payloads, all planetary payloads, and useful manned modules.” Attached to the letter was a table (reproduced on next page) showing the results of NASA’s evaluation of various shuttle configurations. The letter said that “the question of a liquid as opposed to a solid booster is not yet completely settled—there are some open technical questions” and “the differences in operating costs [for the two boosters] have not yet been determined with accuracy.” For these reasons, NASA recommended that the choice among booster options should be deferred for two months to allow additional study. As NASA submitted its budget request, it did not know that President Nixon had already made a tentative decision that NASA’s budget for FY1973 would be in the $3.3-$3.4 billion range, with a strong bias toward approving space shuttle development. That decision originated with OMB Deputy Director Cap Weinberger and had been approved by the president. But that informa­tion had not been communicated to the White House technical and budget staffs, much less to NASA, and thus had little impact on NASA’s interactions with OMB and OST over the next four months. Weinberger had discovered as he met with Fletcher on August 5 that the budget target for NASA that had been recommended by his staff would mean the eventual end of the U. S. human space flight program. This was not an acceptable option to Weinberger, and on August 12 he had sent a thoughtful memorandum to President Nixon. That memorandum is worth quoting at some length. and many remaining NASA programs. I believe this would be a mistake. 1. The real reason for sharp reductions in the NASA budget is that NASA is entirely in the 28% of the budget that is controllable. In short we cut it because it is cuttable, not because it is doing a bad job or an unnecessary one. 2. We are being driven, by the uncontrollable items, to spend more and more on programs that offer no hope for the future: Model Cities, OEO [Office of Employment Opportunity], Welfare, interest on the National Debt, unemployment compensation, Medicare, etc. Of course, some of these have to be continued, in one form or another, but essentially they are pro­grams, not of our choice, designed to repair mistakes of the past, not of our making. 3. We do need to reduce the budget, in my opinion, but we should not make all our reduction decisions on the basis of what is reducible, rather than on the merits of individual programs. 4. There is real merit to the future of NASA, and its proposed programs. The Space Shuttle and NERVA particularly offer the opportunity, among other things, to secure substantial scientific fall-out for the civilian economy at the same time that large numbers of valuable (and hard-to-employ – elsewhere) scientists and technicians are kept at work. . . It is very difficult to re-assemble the NASA teams should it be decided later, after major stop­pages, to re-start some of the long-range programs. 5. Recent Apollo flights have been very successful from all points of view. Most important is the fact that they give the American people a much needed lift in spirit (and the people of the world an equally needed look at American superiority). Announcement now, or very shortly, that we were cancelling Apollo 16 and 17 . . . would have a very bad effect, coming so soon after Apollo 15’s triumph. It would be confirming, in some respects, a belief that I fear is gaining credence at home and abroad: that our best years are behind us, that we are turning inward, reducing our defense commitments, and voluntarily starting to give up our super-power status, and our desire to maintain our world superiority. America should be able to afford something besides increased welfare, programs to repair our cit­ies, or Appalachian relief and the like. 6. I do not propose that we necessarily fund all NASA seeks—only that if we decide to eliminate Apollo 16 and 17, that we couple any announcement to that effect with announcements that we are going to fund space shuttles, NERVA, or other major, future NASA activities. If the NASA leadership had known of Weinberger’s memorandum and Nixon’s response, they likely would have been much less nervous about the outcome of NASA’s negotiations with OMB over the FY1973 budget. The Weinberger memorandum represented one of several points in 1971 when it could be said that a decision to approve space shuttle development had been made. But if there was such a decision made on the basis of the memo, it was to approve the idea of a space shuttle, not a specific shuttle design. NASA in its budget submission left itself vulnerable to continued debate over what shuttle design merited presidential approval by its admission that it would take another six months to make the configuration choice. That debate was not long in coming. There were two major issues with respect to the space shuttle left unre­solved as the January 5 statement was issued. One was what means would be used to boost the shuttle orbiter off the launch pad. The other was the character of the budgetary commitment to the shuttle program being made by the Nixon administration. The first of these was resolved by early March; the second persisted over the next few years. NASA after January 5 began a rapid examination of four alternatives for lifting the shuttle orbiter off the launch pad: parallel burn solid rocket motors, series burn solid rocket motors, parallel burn recov­erable pressure-fed boosters, or a single series burn pressure-fed booster. The two parallel burn configurations had their origin in the studies carried out by McDonnell Douglas and Grumman and resem­bled the thrust-assisted orbiter shuttle (TAOS) design suggested in Mathematica’s October memorandum. By early March NASA headquarters had made its choice—to go with solid rocket motors fired at liftoff in parallel with the orbiter’s engines to boost the shuttle off the launch pad. The "principal reason for going to the solids was the low technical risk and the approximate one half billion to one billion [dollar] savings" in development costs.